In Canada, you can buy some computers with different keyboard layouts: US Standard, Canadian Multilingual, Canadian French. When I ordered the MSI Wind netbook I wasn’t aware of the choices and accidentally picked up the Canadian French version. The problem is I am used to the US Standard keyboard layout, I use it at work and on my iMac. This makes using the MSI Wind netbook difficult and a bit annoying. 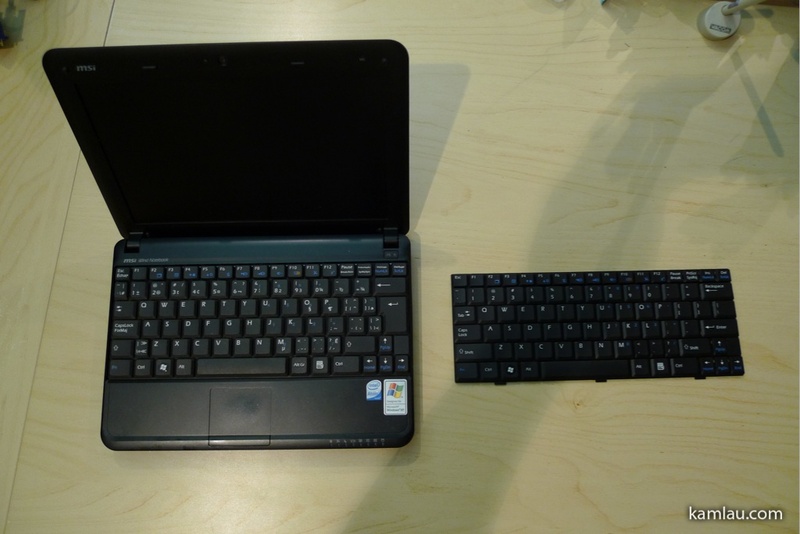 This is of course compounded by the fact that the keyboard on the MSI Wind netbook is a little bit smaller than the regular size keyboards. 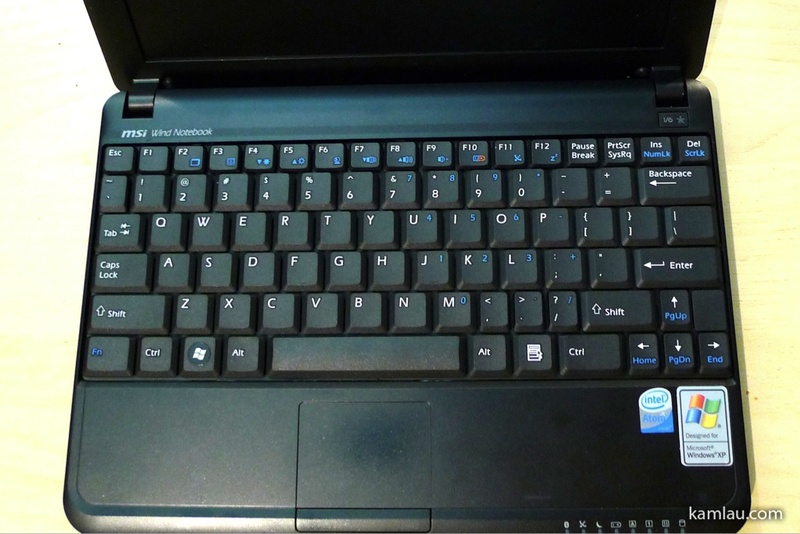 I was often frustrated when using the MSI Wind netbook, my typing speed was halved and my typos were doubled. One day I decided to change the keyboard. I found NCIX was selling the US keyboard for C$49.99. Given the netbook is only about C$350 these days, it does not make sense to pay that much for the keyboard. I found a much cheaper vendor on eBay with free shipping and it costs US$20. 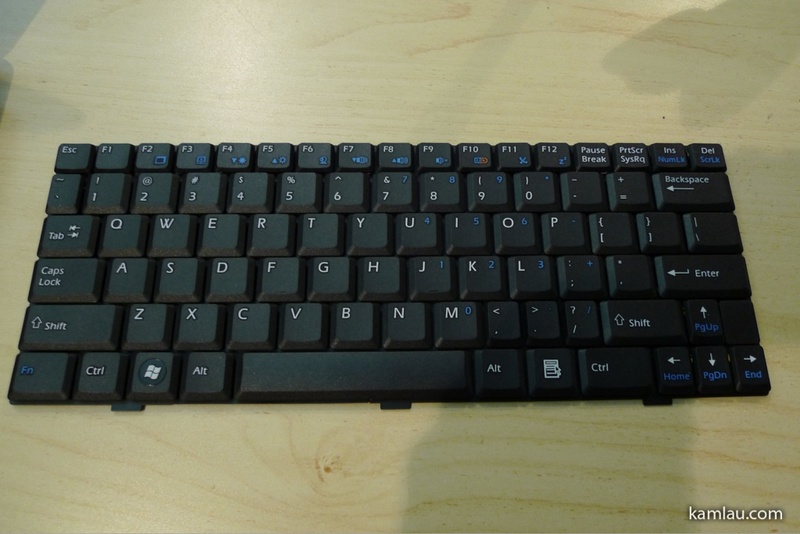 Here is a side by side comparison of the two keyboards before I switched them. 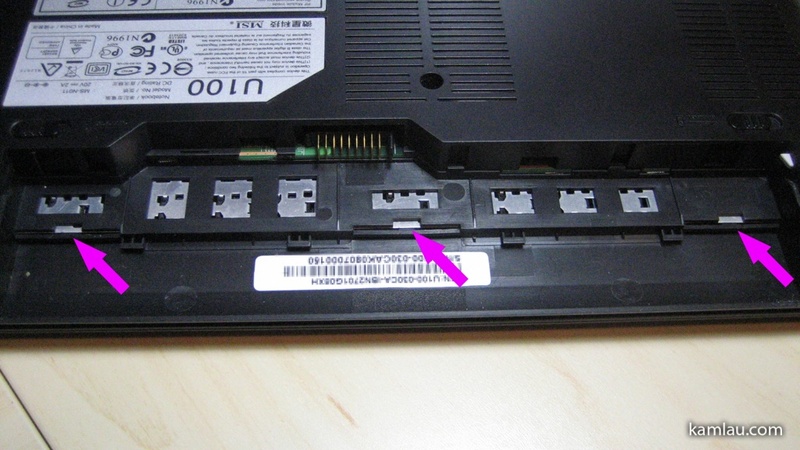 To remove the existing keyboard, flip the netbook over and remove the battery. 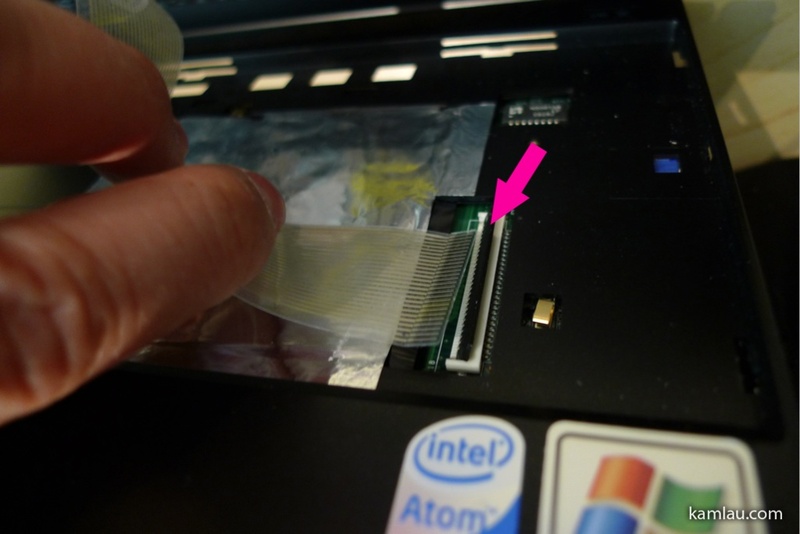 Locate the 3 small clips that are securing the metal backing of the keyboard. Carefully pry them away to unhinge the keyboard. The clips are quite small so you have to be extra careful. 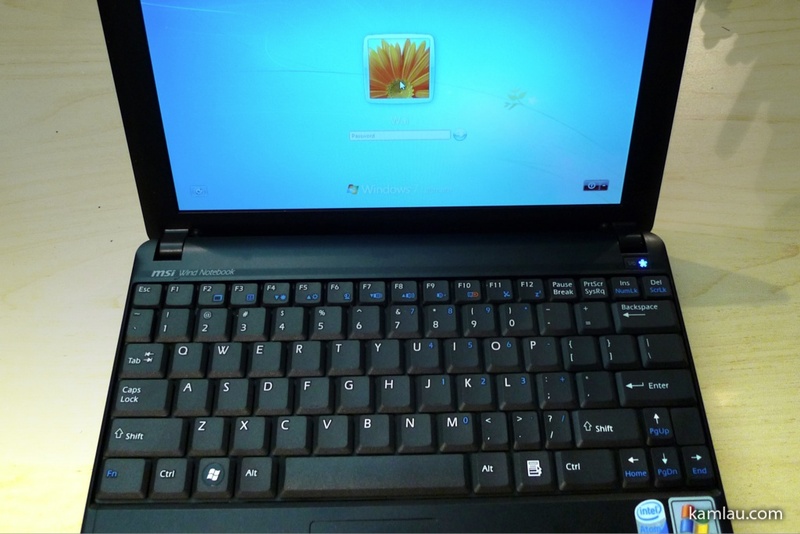 Once unclipped, you can flip the netbook right-side-up, open the screen and tilt the keyboard out of the front side. The keyboard connection can be disconnected by flipping the black cable clip up. 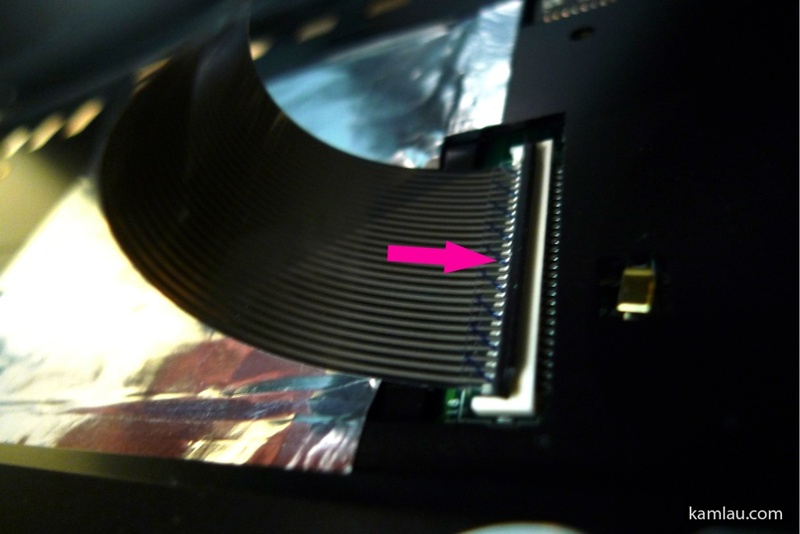 Carefully remove the end of the ribbon cable from the connector. 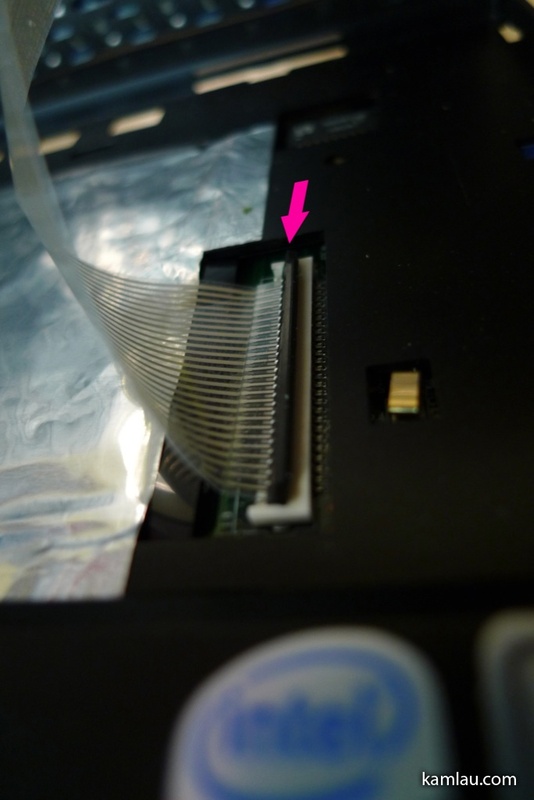 Slide the ribbon cable connection of the US keyboard to the connector. Then flip the black clip back to secure the cable. 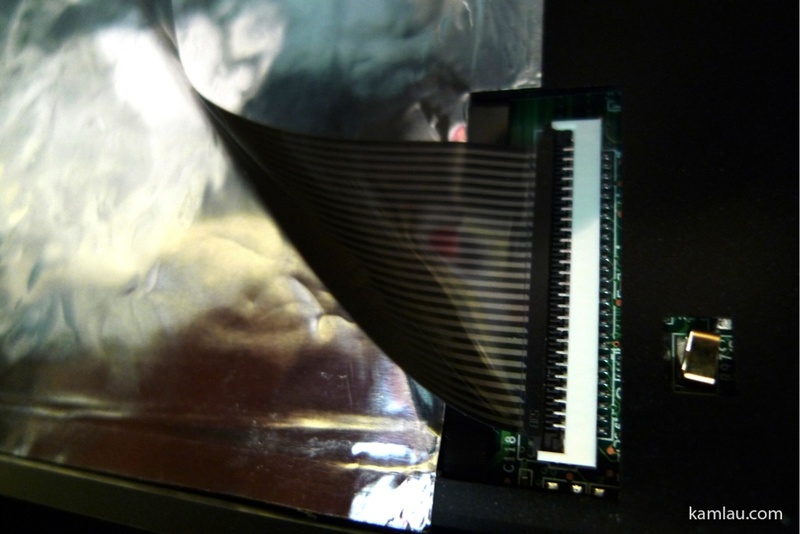 Once the clip is firmly secured, check to ensure that the cable cannot be unplugged from the connector. You should be able to snap the keyboard back to the clips easily. 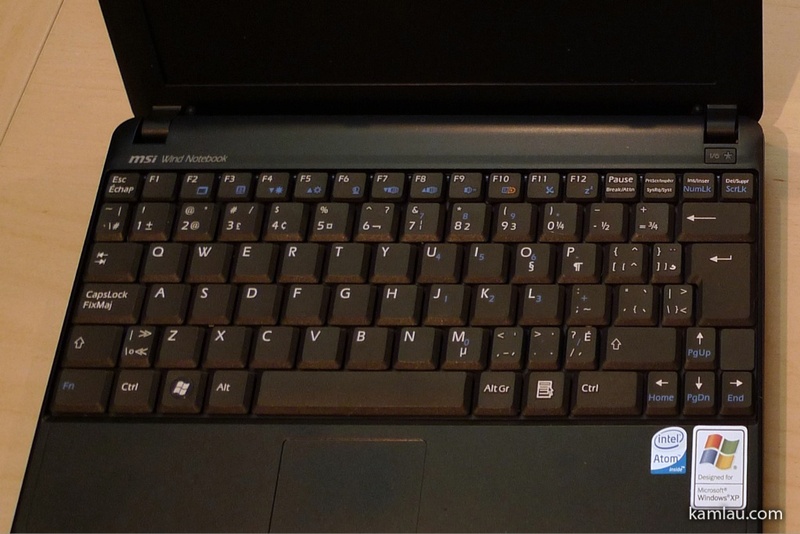 Here is the finished MSI Wind netbook with a US Standard keyboard. And Windows 7 booted up without any complaints! Updated 2009-12-20 with Wim’s suggestions. yes, I forgot to mention that the warranty is void by having it opened. I actually had it open a few times for adding RAM, replacing the mini wireless card and then the keyboard. Let me know which SSD drive you ended up getting and if that saves you any battery life. My 3-cell battery only last me 2 hours max. Ah, I use to have to change the keyboards on laptops at work all the time. What a tedious task…but it is not to difficult. Thanks for the online instructions! .-= Top@Top Ten´s last blog ..Top Rated Netbook =-. You are welcome Top Ten :) Glad it is useful to you. 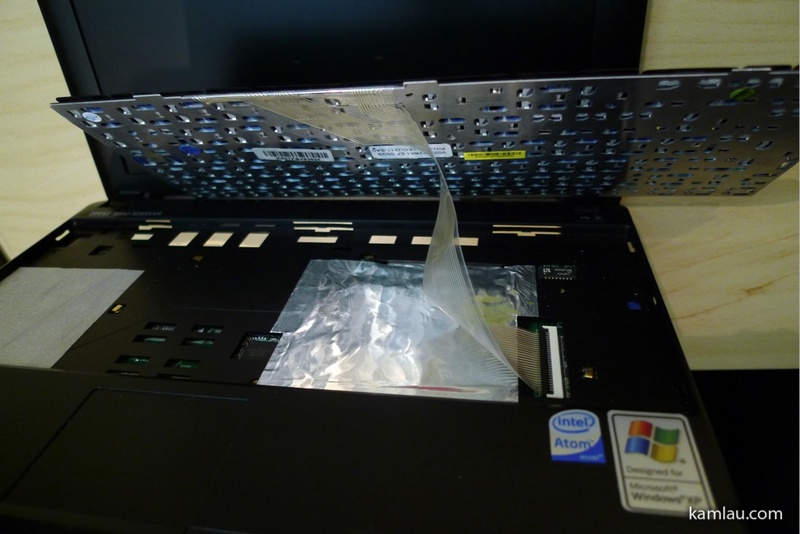 first, I think you do not need to open the laptop or unfasten the screws, just taking out the battery should be fine – probably you do not void the warranty like this. Secondly, I think the arrows indicating where you can unclip the metal keyboard frame in the 8th picture, are not placed correctly. In fact, you have to unclip it not on 4 spots, but on the 3 spots just in between. Thanks for sharing the better way to switch the keyboard. I checked under the battery and I am thrilled to find out that your procedure is so much simpler. I’m going to attempt to replace the keyboard on my UK Advent 4211B (I think it was called a B when I bought it). I’ve broken the Z completely and the letters are wearing off some of the other keys. I assume that an MSI Wind U100 keyboard will fit? Given Wim’s amendments, is there anything I should change from the procedure in your series of pics? Hi Patricia, as far as I know, the Advent 4211 is an OEM version of the MSI Wind (http://en.wikipedia.org/wiki/MSI_Wind_Netbook). I believe the replacement procedure I describe above would apply to your Advent 4211 netbook. It was updated with Wim’s amendments already. Good luck and hope your replacement is successful. Cheers! I’ve removed my last, and my friends notebook/netbook(asus,acer,dell) keyboard and all of them succeed in the first try…. is there something different with wind keyboard? or is it just mine? Hi Shiro, as far as I know, there are no additional clips or adhesive under my MSI Wind keyboard. But mine is a U100 so it could be a different keyboard all together. can u clarify what you mean by ‘pry away’ the 3 small clips…from underneath or above. sorry, don’t mean to be obtuse, just never fiddled with computers before and i’m paranoid. This information has just saved me £80.00. I took my daughters notebook to Currys/PC World, becauae the keyboard had stopped responding to any keystokes. They told me the keyboard needed replacing and that they would have to send it away for four weeks. I followed your instructions and removed the keyboard to find that the cable had become loose. After reseating the cable the keyboard started working. What a result. Thank you very much. Hi Paul, glad it worked out for you and thanks for visiting. Thank you; 5 minutes after reading this, I had successfully replaced the keyboard on my Advent 4211C. Yay! Thanks especially for your answer to Diane’s question. Once I read that and examined the clips all doubts vanished and I achieved instant enlightenment. Or at least a keyboard that works properly in about 5 minutes. I had already done the hard drive. That’s easy enough too — you just take out the screws on the bottom so you can take the case apart and then it’s obvious. There’s a little hand and arrow on the bottom of the case that shows you which way to push the case so that the parts will separate easily. Is it worth the upgrade? With a 5400rpm hard drive, the netbook runs rather slowly in today’s standard. I am spoiled by the SSD drive I had in my other notebook computers. But not sure if the Atom processor in the MSI Wind will realize the full potential of the SSD drive? What is your experience? It was more a replacement than an upgrade–I wanted a larger drive so I used one I happened to have around. Sorry for being confusing! Thank you very much for this. It gave me the confidence to do it myself! Adverse tho’ I am to fiddling around with hi tech kit, It is something anyone could do as long as you take it easy,follow the steps and be gentle with the device. Typical, I could not source a new keyboard in the UK for my Advent 4211/B but there are plenty of new ones for the MSI Wind around,so I used one of those – as it is the same machine with a different badge. American keyboard,but doesn’t matter as I am well used to that. And I got a white keyboard which looks really cool on the Advent. Hope I can keep my handy little Advent for a few years more,though maybe will have to change it to Chrome OS or Linux when XP stops being supported next year. How exactly do you remove the three small clips. I broke one of them trying to pry them out. Brian, you have to be quite gentle as these are plastic clips. They are flexible but only when moved in the right direction. I remember when I was doing it, I had to pry it away from the keyboard and towards the edge of the computer. Hope this helps.